Blue Exorcist (Japanese: 青の祓魔師（エクソシスト）, Hepburn: Ao no Ekusoshisuto) is a Japanese supernatural action manga series written and illustrated by Kazue Katō. The manga has been serialized in Jump SQ magazine by Shueisha since April 2009, with individual chapters collected into sixteen tankōbon volumes as of January 4, 2016. The story revolves around Rin Okumura, a teenager who discovers he and his twin brother Yukio are the sons of Satan born from a human woman, and he is the inheritor of Satan's powers. When Satan kills their guardian, Rin enrolls at True Cross Academy to become an exorcist under Yukio's tutelage in order to defeat his father. The series was adapted into an anime television series by A-1 Pictures during 2011 and into an anime film (Ao no Exorcist Gekijouban) in December 2012. Viz Media has licensed the manga for North American production, with the first volume released in April 5, 2011. Aniplex of America also released the anime's DVDs in English regions. A second season, titled Blue Exorcist: Kyoto Saga, is scheduled to premiere on January 7, 2017. Rin wishes to become an Exorcist like his guardian to become stronger and defeat Satan. He enrolls at the prestigious True Cross Academy exorcist cram school, which is actually the Japanese branch of an international organization dedicated to protect the human realm, Assiah, from the demonic realm, Gehenna. Much to his surprise, he finds that Yukio, is already a veteran Exorcist and is one of his teachers. Thus begins Rin's journey to become an Exorcist, accompanied by his brother and his fellow students who quickly become his close friends. Inspired by the 2005 film The Brothers Grimm, Kato tried to work the angle of brothers fighting monsters into a story. She eventually decided on making the story about demons and exorcists, thus conceiving Blue Exorcist. Due to exorcists being the main idea of the story, the manga features a lot of Biblical references. In an interview with Anime News Network, Kato said, "I should not run away from these references if I'm working in the Exorcist genre." An ending was planned by Kato but the exact length of the series has yet to be decided based on the manga's popularity in Japan. The chapters of the Blue Exorcist manga series are written and illustrated by Kazue Kato and have been serialized by Shueisha in the monthly manga magazine Jump SQ since April 2009. The first tankōbon volume was released on August 4, 2009; seventeen volumes have been released as of July 4, 2016. The one-shot of the manga was first featured in the September 2008 issue of Jump SQ and was titled Miyamauguisu House Case (深山鶯邸事件, Miyamauguisu-tei Jiken). The series was licensed by Viz Media for release in North America, with the first volume released on April 5, 2011; fifteen volumes have been released as of April 20th, 2016 and a 16th volume is scheduled for December 6, 2016. Blue Exorcist has also been released as part of the Shōnen Jump Advance imprint starting April 5, 2011. The series is also licensed in France by Kazé Manga, with the first volume released on May 27, 2010, and in Poland by Waneko. A spin-off focused on Rin's brother Yukio is running on Jump SQ.19, titled Salaryman Exorcist: The Sorrows of Yukio Okumura (サラリーマン祓魔師 奥村雪男の哀愁, Salaryman Futsumashi Okumura Yukio no Aishū). It is also written by Kazue Kato, but with illustrations by Minoru Sasaki. An anime adaption for the manga was announced on November 27, 2010 on Shueisha's Jump SQ official website. The anime was produced by A-1 Pictures with Hitoshi Okamura as the producer. Originally, the series was scheduled to air on April 10, 2011 on MBS, replacing Star Driver: Kagayaki no Takuto; however, due to the March 11, 2011 Tōhoku earthquake and tsunami the series' broadcast was delayed until April 17, 2011. The anime ended on October 2, 2011. Four pieces of theme music are used for the episodes: two opening themes and two ending themes. The opening theme for the first 12 episodes is "Core Pride" by Japanese rock band Uverworld, while the opening theme from episode 13 onwards is "In My World" by Japanese rock band ROOKiEZ is PUNK'D. The ending theme for the first 12 episodes is "Take Off" by South Korean boy band 2PM, while the ending theme from episode 13 through episode 25 is "Wired Life" by Japanese singer Meisa Kuroki. Aniplex announced they would simulcast the series in North America through video sites Hulu, Crunchyroll, Anime News Network and Netflix starting on April 20, 2011. Aniplex of America released Blue Exorcist on DVD in four sets, starting by releasing the first DVD on October 18, 2011. An Original Animated Video (also knows as an OVA) has also been released in 2011, called Ao No Exorcist: Kuro no Iede. The series began broadcasting in the United States and Canada on Viz Media's online network, Neon Alley, on October 2, 2012. The series began airing on Adult Swim's Toonami block on February 23, 2014 and finished airing on August 10, 2014. A sequel anime, titled Blue Exorcist: Kyoto Saga, is scheduled to premiere on January 7, 2017. Koichi Hatsumi will direct the sequel, with Toshiya Ono writing the scripts, Keigo Sasaki designing the characters, and Hiroyuki Sawano and Kohta Yamamoto composing the series' soundtrack. A-1 Pictures will return to produce the animation. It was also announced that there will be five new characters in the sequel. The opening theme song will be performed by Uverworld, while the ending theme song will be performed by Rin Akatsuki. A stage play based on the series titled Live Act Ao no Exorcist ~Mashin no Rakuin~ ran for nine performances at the Nippon Seinenkan hall in Tokyo's Shinjuku ward from May 11 to 17 during 2012. Satoshi Owada directed and wrote scripts for the play. Main characters Rin and Yukio Okumura were portrayed by Ryou Kimura and Kimito Totani respectively. A light novel titled Ao no Exorcist: Weekend Hero was written by Aya Yajima and illustrated by Kato. It was released by Shueisha on September 2, 2011. A visual novel for PlayStation Portable, Ao no Exorcist: Genkoku no Labyrinth was released on April 26, 2012 by Bandai Namco Games. Ao no Exorcist Movie is based on the manga and anime series and was released on December 28, 2012 in Japan. The manga has been popular in Japan with the seventh volume receiving first print run of one million copies becoming the first Jump SQ manga to reach such milestone. The release of the anime also drastically increased the manga's sales to the point that Shueisha decided to increase the print run for the seventh volume. Critics have praised the Blue Exorcist manga with Comic Book Bin reviewer Leroy Douresseaux feeling the first volume had potential, enjoying the comedy in the work and the characters and their interactions, recommending it to teen readers. Danica Davidson from Otaku USA felt that while the series employs disturbing storytelling, Rin's heroic traits despite being Satan's son make the plot more appealing to the readers. Kato's artwork has been praised by Anime News Network's Carlo Santos for the way each character has distinct traits while background images are well designed. Despite noting that the story uses several clichés, Carl Kimlinger from the same site emphasized how the execution was well-performed, resulting in entertaining episodes, especially its fight scenes, which were noted to be one of the anime's strongest points. ↑ 青の祓魔師 16 (in Japanese). Shueisha. Retrieved December 28, 2015. ↑ "Blue Exorcist/Ao no Exorcist Anime Film Green-Lit". Anime News Network. September 30, 2011. Retrieved October 5, 2011. 1 2 Aoki, Deb (July 22, 2016). "Interview: Blue Exorcist Mangaka Kazue Kato". Anime News Network. Retrieved October 31, 2016. ↑ "Interview: Kazue Kato". Manga News (in French). November 18, 2010. Retrieved June 14, 2012. 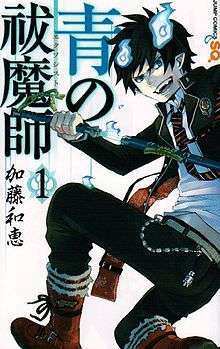 1 2 "News: Blue Exorcist Manga Listed by Viz's Distributor". Anime News Network. October 19, 2010. Retrieved March 21, 2011. ↑ 青の祓魔師1 (in Japanese). Shueisha. Retrieved 2009-07-18. ↑ "青の祓魔師17". Shueisha. Retrieved June 8, 2016. ↑ "One Shot of Blue Exorcist" (in Chinese). Retrieved 2009-09-16. ↑ "Blue Exorcist, Vol. 16". Amazon.com. Retrieved June 7, 2016. ↑ "Viz Media Announces New Manga Acquisitions for Spring & Summer 2011". Anime News Network. November 15, 2010. Retrieved March 21, 2011. ↑ "Blue Exorcist – Tome 1" (in French). Kazé Manga. Retrieved July 17, 2010. ↑ Melmothia (October 1, 2013). "Ao no Exorcist tom 1". Tanuki.pl (in Polish). Małgorzata Kaczarowska. 240 (2905). ISSN 1898-8296. Retrieved November 22, 2013. ↑ "News: Blue Exorcist Manga Gets TV Anime Green-Lit". Anime News Network. November 27, 2010. Retrieved November 27, 2010. ↑ "News: Anime/Manga Releases Delayed After Quake: Part III". Anime News Network. March 19, 2011. Retrieved March 21, 2011. ↑ "UVERworldの新曲が、注目アニメのテーマ曲に決定" [Uverworld's new song to be featured as an anime's theme song]. Oricon (in Japanese). April 5, 2011. Retrieved April 18, 2011. ↑ "アニメ｢青の祓魔師｣テーマソングはUVERworld&2PM" [Anime Blue Exorcist Theme song by Uverworld & 2PM] (in Japanese). Natalie. March 9, 2011. Retrieved March 21, 2011. ↑ "Aniplex to Stream Blue Exorcist In U.S., Canada". Anime News Network. April 8, 2011. ↑ "Aniplex of America Adds Madoka Magica, Blue Exorcist on Home Video". Anime News Network. Retrieved July 1, 2011. ↑ "Viz Media to Stream Dubbed Blue Exorcist on Neon Alley". Anime News Network. Retrieved June 29, 2012. ↑ Green, Scott (June 29, 2016). "2017 "Blue Exorcist" TV Anime Announcement Spotted". Crunchyroll. Retrieved June 30, 2016. ↑ "Blue Exorcist: Kyoto Impure King Arc Anime Reveals January Premiere, More Cast". Anime News Network. October 2, 2016. Retrieved October 2, 2016. 1 2 Green, Scott (November 29, 2016). ""Blue Exorcist -Kyoto Saga-" Visual Spotted Along with Theme Song Performers". Crunchyroll. Retrieved November 29, 2016. ↑ "Ao no Exorcist Kyoto Fujouou-hen Confirms January 2017 Air Date, Releases PV and Key Visual". Nagame Digital. October 11, 2016. Retrieved October 11, 2016. ↑ Green, Scott (June 30, 2016). "Different Writer/Director Team To Lead New "Blue Exorcist" TV Anime". Crunchyroll. Retrieved June 30, 2016. ↑ "New Blue Exorcist TV Anime's Returning Cast, New Staff, Plot, 2017 Premiere Revealed". Anime News Network. July 3, 2016. Retrieved July 3, 2016. ↑ "Blue Exorcist Stage Play Cast Photographed in Costume". Anime News Network. April 25, 2012. Retrieved June 6, 2012. 1 2 "Blue Exorcist's Latest Manga Book, 1st Novel Top Charts". Anime News Network. September 7, 2011. Retrieved June 6, 2012. ↑ "Blue Exorcist: Genkoku no Labyrinth PSP's 3rd Promo Streamed". Anime News Network. March 13, 2012. Retrieved October 10, 2012. ↑ Douresseaux, Leroy (March 24, 2011). "Blue Exorcist: Volume 1". Comic Book Bin. Toon Doctor. Retrieved September 21, 2016. ↑ Davidson, Danica (May 13, 2011). "Blue Exorcist vol. 1". Otaku USA. Sovereign Media. Retrieved June 11, 2012. ↑ Santos, Carlo (December 11, 2011). "Blue Exorcist GN 5". Westmount, Quebec: Anime News Network. Retrieved June 11, 2012. ↑ Kimlinger, Carl (June 3, 2011). "Blue Exorcist Episodes 1–6 Streaming". Westmount, Quebec: Anime News Network. Retrieved June 12, 2012.